This week’s feature is from Cassandra Padgett, a health coach at ViVfit (www.vivfitness.com). I first met Cassie on the Peanut app, which is where I met most of my new mom friends actually! Cassie is dedicated to making healthy choices EASY for the busy modern moms. 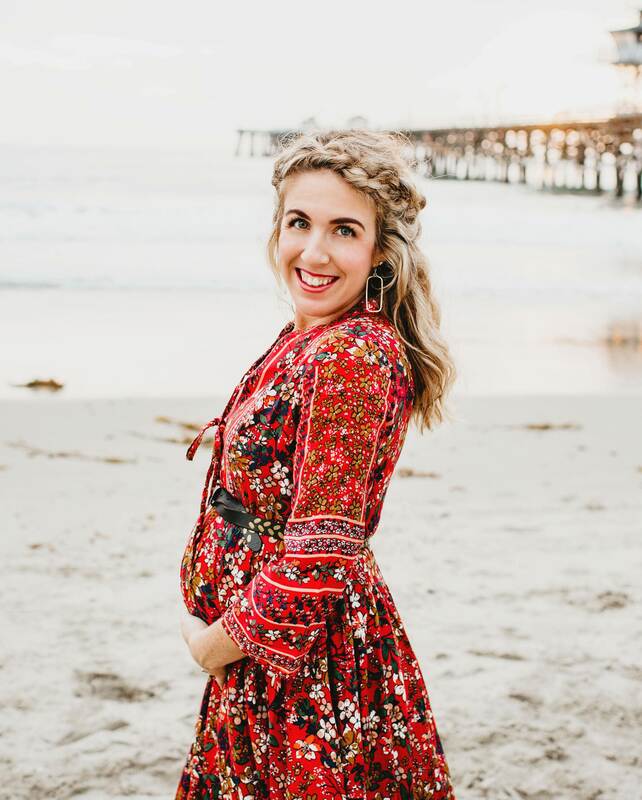 She spends her days coaching part time in a pediatric clinic, and coaching her own clients through simple but powerful nutritional habit changes. She loves hanging out with her husband, her (almost) two-year old daughter, Elle, and their bulldog Buddha. You can find her eating, cooking, and lounging in leggings when she isn’t at work! Thank you Cassie for being a part of our Real-Girls: Mothers community! Finding magic in the midst of motherhood + marriage is something we are all doing, together. Motherhood is not easy for every mama, and goodness knows it takes time to adjust into that new role. Read below for Cassie’s story about her transition into motherhood! Don’t forget to download your free Healthy Mamas Toolkit from ViV Fitness at the end of this post! Even though I believe I was born to be a mom — since I was a nurturing oldest sibling, and who loved babysitting and nannying for years — stepping into my own role as a mother was surprisingly difficult. I remember the first time the pediatrician’s office called asking for “Elle’s mom”. She was less than a week old. “I guess that’s me…” I thought. It kind of felt like the first time I introduced myself as my husband’s wife: Like a crucial part of my identity was there, that I just wasn’t used to yet. It caught me off guard. I had been preparing for months…my whole life really, to become a mother. Shouldn’t this come naturally? I suffered postpartum anxiety which led me to feel like I couldn’t be at peace with myself. I was constantly worried something terrible was about to happen. While the postpartum anxiety made the transition into motherhood challenging, the biggest transition into new motherhood came from how I spent my days as a new mom. I spent my pregnancy in grad school full time while also working full time. I graduated the month before my daughter was born, and took an extended maternity leave from work (for which I am very grateful for). Going from spending my days working and taking classes and studying to all of a sudden feeling isolated at home was a big transition. Some women thrive being stay-at-home moms. Some women are ready to get back to work at 12 weeks postpartum. Most women are a little of both and use part time day-care or work from home during naptime or after bedtime. There is not ONE right answer. Only what is right for you. I ended up staying home with my daughter for about 15 months. I started a coaching business and health blog early in her life, which kept me busy and “in” my field. I made connections online with other women. I used the Peanut app to have “mom dates” (how I met Becca, actually ☺ ). I started to get comfy in my role as “mom”. And it felt sooooo good. Just like how I always imagined! There is power in stepping into your own power. Stepping into what makes you feel like YOU without guilt and without over-thinking it. Just doing what makes you feel like you. Eventually, I went back to work part time. I’m currently working as a health coach in a pediatric office 20 hours a week. I do what I love and I’m grateful I have the opportunity to continue to stay involved in my field, and also stay involved in my daughter’s life. I’m doing work that is meaningful and rewarding and I honestly am so grateful. But wearing all the hats is a hard task. Sometimes I feel guilt and sadness come over me while at work. On the other hand, sometimes long days at home leave me craving the quiet time at my desk where I can just drink my coffee in peace. The thing is though, mom guilt doesn’t benefit anyone. I work with moms in my own coaching practice, and every day I hear women tell me how much better they feel when they pay attention to their own needs. There is no award for putting yourself last. I look back at my own early days coming into my own as a mom, and wish I could give myself a hug. As the months passed, I realized that showing myself love was the key to feeling my best. And the key to showing myself love was being honest about my own needs, not feeling like I was “supposed” to love every second of stay-at-home motherhood. If there’s one thing I’ve learned from my own experience and from working with moms in all stages… you CANNOT put yourself last! Love yourself. Like really learn to LOVE yourself. If you wouldn’t say it to your daughter or your best friend, don’t say it to yourself! Speak to yourself in a positive way by using with the uplifting tone you would use with someone you care about. If you aren’t sure where to start, here’s a few things to try: when you lay down at night, or sit down to nurse, close your eyes, mentally scan your body and think about what you love about each part of your body (i.e. my strong legs carry me and my baby up and down stairs all day, my lips give a million kisses to my baby’s head each day, my brain got me through college and helps me manage my crazy household, my hands wash all the laundry and dishes, my belly was a home for my beautiful baby). Each day it will get easier, and soon you will see the benefits of not being so dang hard on yourself. Speak your mind. There are people around you who love you and truly want to help. Unfortunately, they can’t read your mind. If you’d rather dinner be dropped off without conversation, let them know. Tell your partner what you need help with most. It makes things easier on everyone if you voice your expectations and needs. If you need to vent, call your BFF. If you need alone time, ask for it! Don’t put yourself last. Schedule your doctor’s appointments, get your favorite coffee, call a friend, get a pedicure, join a mom’s group, go to the gym, start a blog. Do what YOU need to do to feel fulfilled. There is NO reason to spend your days resentful or feeling like you are doing anyone a favor by putting yourself last. Drink plenty of water and have healthy snacks on hand. You will feel better eating nutrient dense foods and staying hydrated. A few of my favorite healthy snacks include: an apple with peanut butter + Greek yogurt + fruit, or lunch meat with a string cheese and pretzels. Nourish yourself with real, whole foods instead of living off coffee and junk food. I promise it makes a difference in how you feel. Only focus on what matters. Relieve yourself of the burden of doing everything perfectly. If something that you thought you would like to do as a mom isn’t working out (being a stay at home mom, breastfeeding, baby wearing, using cloth diapers, being a working-mom etc. )…just move on! Life and the newborn days are too short to waste time and energy doing something you don’t care enough about. At the end of the day, we all are just doing our best and doing what works for us. We all have different interests, different desires, and different ideas for what modern family life looks like. No one has it all figured out. Follow along on social media for simple health tips and self-love inspiration! @vivfitcoach on Instagram and Facebook. I loved this one! I feel like so many moms can relate! Great post, so informative, can relate so much to this. Great blog and love the tips. It always surprises me how difficult we are on ourselves. It is so important that we learn to love ourselves more and put our needs as priority.